Tina and I are both big Gonzaga basketball fans. Several months ago when they had an undefeated season going we talked about getting airline tickets to come down to Phoenix where the Final Four games are being played. We figured even if Gonzaga didn't make the Final Four, we would be down here to have fun at the festivities that go on all over town. So here we are in beautiful downtown Phoenix, and the Zags are coming to the Final Four and today we scored a pair of tickets to the games. Before the Zags won that last game that ensured they would be in the Final Four we had volunteered to work at some of the Fan Fest activities. We're both going to be working at the Fan Fest Command Center, both at Sponsorship Support activities and booths and I've volunteered to be a driver for one shift. In that position I drive one of their rental vehicles to shuttle VIP's, NCAA staff and others around from one location to another. Likely that will be taking people from their hotel to the airport. Now we just sit back with our fingers crossed and hope the Zags win this whole shooting match. Wouldn't it be too cool if Zags and Ducks fight it out for the championship? How about a Gamecocks/Tarheels shootout for all the marbles? Believe me that will be pandemonium in the Carolinas. The Gamecocks have had an unbelievable tournament. It they win it all a bunch on Los Vegas odds makers will lose a lot of money. Go Gamecocks. Any of the four teams in this are capable of coming out on top. It could end up with a WA vs OR contest or a NC vs SC contest. Either of those would bring out heightened emotions. I don't care who plays in the final game as long as the Zags come out on top! Ghot Dyam what a day! In fact, what a couple of days. We started off yesterday working in the Final Four Command Center. 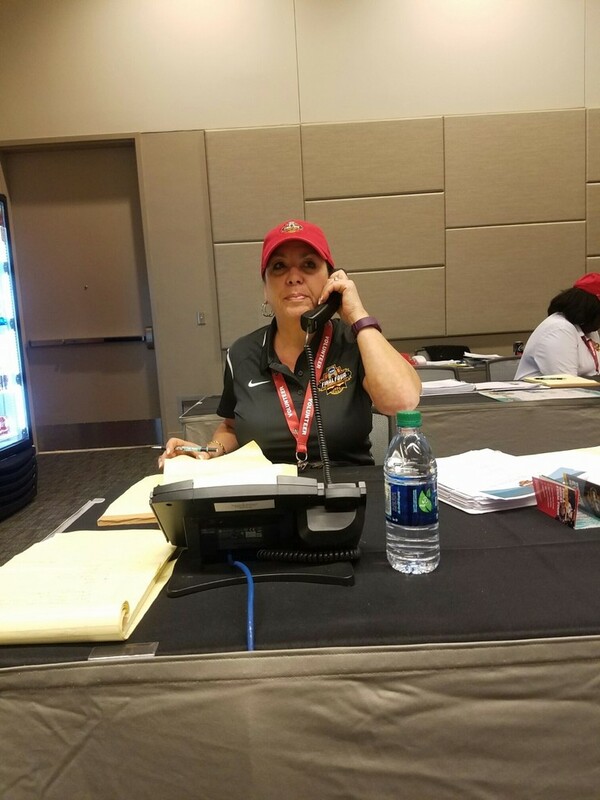 It's the call center for everyone who has a question about where and when events are and for volunteers who are calling to check in for their shift. As luck would have it, the desk I plopped myself down at was the one with the main phone on it. That meant that every call came that came in rang at that phone and I got it. If I was busy on a call it would roll over to another phone. I answered somewhere between 85-100 phone calls in the 5 hour shift. That doesn't sound like much but many required looking for information in the several volumes of "stuff" we had. Here's a shot of Tina (AKA "GW") answering my phone when I took a short run to the head. And one of yours truly doing my thing. Yeah, I know, I have a TON of grey hair and I earned every darn one of them! And Yeah, I know, she looks like my daughter. Everyone says that. So today was game day. We only live about 20 minutes from the stadium (University of Phoenix Stadium) so getting there was easy. Also, we've been there often enough that we know how to get there using the surface streets once we get into the local area. I have a ton of photos and videos but they're on my phone and I don't have an easy way to get them from the phone to the laptop. I'll try to take care of that tomorrow. We spent a couple of hours wandering around the tailgate party area, rode a ferris wheel, ate lunch, had a beer and enjoyed a beautiful, sunny day with zero wind or clouds. Game time was 3:00 so about 1:30 we wandered into the stadium. We got to our seats, lower level in a corner of the stadium 29 rows up from the floor. Pretty decent seats. If you watched the game you know it was a heart attack maker waiting to happen. Gonzaga had a 9 point lead at the half. Then stretched that to a 14 point lead about 1/3 of the way through the second half. Then they gave the Gamecocks a 14 point run to tie the game. DAMN! Now we're down to under 3 minutes left, game tied and I figured we were headed to OT. The lead went back and forth but as it got under a minute we pulled ahead. The Zags had a 3 point lead with a few seconds left. They intentionally fouled USC so that USC could only get 2 shots with the clock at about 2 seconds. That strategy worked, but then USC fouled us, we made all the necessary free throws and ended up winning it by 77-72 (IIRC). Being an NCAA event they don't sell alcohol inside the stadium. We stayed to watch the first half of the Ducks/Tar Heels game then headed for a local bar within walking distance for a cold one. Or two. We're back home now, I'm on my second shot of my friend Jose Cuervo then it's off to bed. Tomorrow we're back working downtown at the Final Four Fan Fest. There are a lot of activities going on so we don't yet know exactly what we'll be doing but I know it will be fun. The Monday it's the NCAA National Championship game against the Tar Heels. That will be a helluva game to watch!